The former vice president promised to be more mindful of physical boundaries, but is he too out of step to be his party's standard-bearer in the #MeToo era? It's simply a "human touch." He's a "warm, affectionate person." He "hugs everybody." In the days since allegations surfaced of uninvited touching on the part of Joe Biden, several women in politics and beyond have been coming to his defense, vouching for his character and saying it was merely his old-fashioned tactile style at issue — nothing intentional, and certainly nothing sexual. But the nature of the defense, coming frequently but not exclusively from older women, as well as Biden's own assertion that he never felt he was acting inappropriately, raises some uncomfortable questions. Chief among them: If Biden really had no idea what he was doing, is he simply too out of step to be his party's standard-bearer in the #MeToo era? "There's a bit of 'not getting it' when it comes to the gender story here," said Debbie Walsh, director of the Center for American Women and Politics. "To me, there's been a patronizing quality to this, an alpha male asserting himself physically, that I think is problematic for him." Speaker of the House Nancy Pelosi, D-Calif., said former Vice President Joe Biden, accused by two women of inappropriately touching them, should understand that he may need to apologize even if he meant well. Neither Lucy Flores, the former Nevada politician who described an uncomfortable kiss on the back of her head, nor the other four women who came forward with their own stories before Wednesday have accused the former vice president of sexual harassment. Rather, they've described behavior that made them feel uncomfortable because it invaded their personal space, regardless of Biden's intentions. 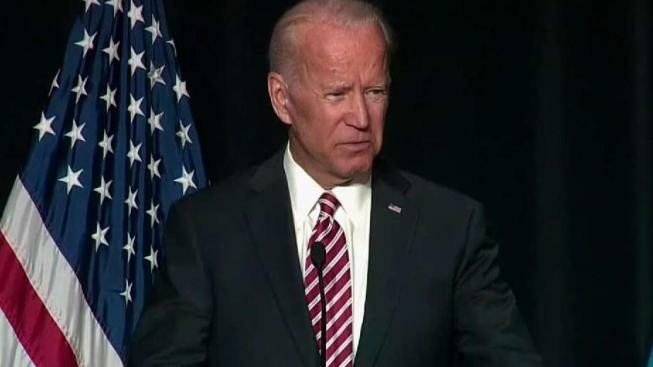 On Wednesday night, The Washington Post reported that three additional women had recounted uncomfortable encounters with Biden. One of them, Vail Kohnert-Yount, said she was a White House intern in the spring of 2013 when she met Biden in the West Wing and that, as they chatted, he put his hand on the back of her head and pressed his forehead to hers and called her a "pretty girl." NBC News has not verified the report. For Biden, of course, the stakes are huge: He's deciding whether to jump into the crowded field for the 2020 Democratic presidential nomination — a field that includes a half-dozen women. Fighting to change the narrative, he released a video statement Wednesday, promising to be more mindful of physical boundaries. "Politics to me has always been about making connections, but I will be more mindful about respecting personal space in the future," he said. "I get it." The statement, his second, came as some prominent women and longtime allies came to Biden's defense, none more passionately than former Sen. Jean Carnahan of Missouri. In a series of tweets, she noted Biden's "human touch" and praised the way he consoled her after she lost her husband and son. "It was his empathy and encouragement ... that gave me strength to meet each day," Carnahan, a Democrat, wrote. "Yes, I sometimes got a shoulder pat or even a head kiss. Joe has a deep desire to share in the lives of others." Across the aisle, Republican Sen. Susan Collins of Maine called Biden "just a warm, affectionate person." 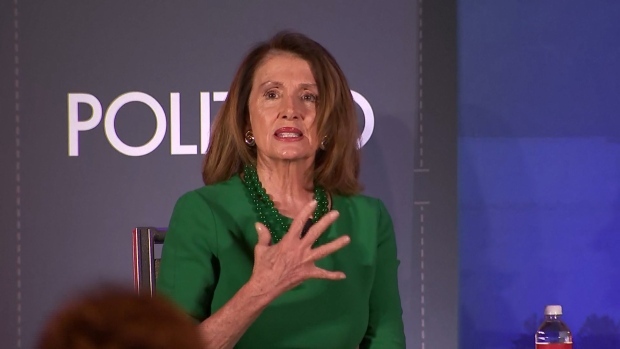 House Speaker Nancy Pelosi, while bluntly counseling him to change his behavior and "pretend you have a cold," said she did not see his behavior as disqualifying him for a presidential run. Beyond politics, Gloria Steinem also had understanding words for Biden, saying in an email to The Associated Press that "I think women are more than smart enough to know that a) Joe Biden is who he is and hugs everybody, b) this was minor compared to most sexual harassment." But the feminist leader immediately added: "We all need to get to a place where bodies are private property and not to be touched without permission." Steinem also noted this was a moment for change on the campaign trail: "When was the last time you saw a female candidate hugging every male supporter?" she mused. "Whatever is going on, it's way too gendered! We need to have the same guidelines for everybody." In his statement, the 76-year-old Biden said he understands the changing "social norms," seeking to ease concerns about whether he is up to adapting to a new era, where what was once considered by some to be charming — a quick compliment on a woman's appearance or a flirtatious hug — is now seen as boundary crossing. Biden's initial comments, insisting that he never knew his behavior was making women uncomfortable, were in themselves troubling to some women. "I keep hearing, 'Well, he's an older man and it's a generational thing,'" said Walsh at Rutgers. "But one of the issues he's going to be confronting as a candidate is a generational question. This may, in fact, point out the generational difference of how he sees women and the way he behaves himself around women." Laura Kelber, 61, a Democratic voter and a screenwriter in New York, takes issue with Biden's focus on his own intentions. Intentions, she said, are not the point. "It's not OK to demean and invade women's space," she said. "It's totally offensive and inappropriate." Kelber said she's proud of younger women for sounding the alert about Biden's physical behavior. But the debate didn't split neatly on generational lines. Meghan McCain called Biden "one of the truly decent and compassionate men in all of politics." The 34-year-old daughter of the late Republican Sen. John McCain is a co-host of "The View," where she and Biden shared an emotional moment during her father's illness. Biden, a friend of the Arizona senator's, was praised at the time for switching seats with another host so he could grasp a weeping McCain's hands as he consoled her. "I feel saddened that people are jumping on this issue just to find dirt," said Rachel Corson, 19. "Someone who is very highly respected in government who might have made a mistake and wasn't clear with his communication ... I find it disheartening that we are looking for something he did wrong." Complicating the debate was the question of a political double standard, given long-standing accusations of sexual misconduct against President Donald Trump and his famous boast, on tape, about groping women. Trump was asked Wednesday whether Biden should apologize for the ways he has interacted with women, and he replied, "No, he's going to make his own decisions. He's very capable of making a decision, I assume." Some feminist advocates have preferred not to comment on the Biden issue because of that perceived double standard, not wanting to criticize either the women expressing discomfort or Biden himself. Some voters, though, had no problem invoking it. "We have a president who grabs crotches, and now we are damning this man?" said Susan Chandler, a 72-year-old retired assistant principal in New Hampshire. Corson, the college student, said she thinks there could be a silver lining to the episode; women may feel bolder about speaking up in situations that perhaps don't rise to the level of harassment but need to be aired nonetheless. "Feeling uncomfortable is never OK," she said. "This may open a window for more people who aren't in the public eye to say, 'Yeah, that happened to me. I felt uncomfortable, and I think it was wrong.'"